Despite the impact of Hurricane Odile, a Category 3 storm that made landfall in Los Cabos on September 14, the destination's golf courses sustained only minor damage and are bouncing back quickly. Directors of golf at Cabo's leading facilities report that clean up and restoration efforts are well underway. With only minor erosion, cactus loss and sand intrusion caused by the storm, golf courses in Los Cabos, which partake of the region's unique mountain-desert-ocean ecosystem, are expected to reopen in excellent condition from now through mid-December. 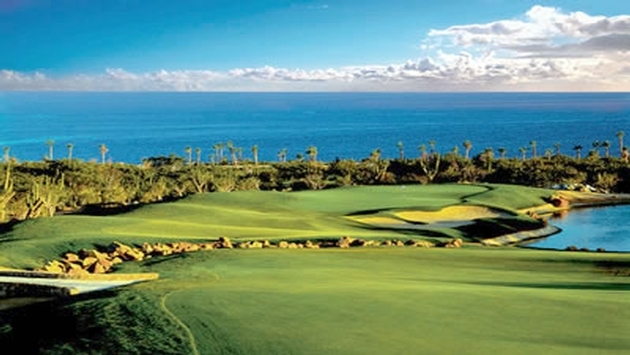 Cabo del Sol Ocean - October 1st holes 10-15 CONFIRMED. Two high-profile newcomers, Quivira Golf Club (designed by Jack Nicklaus) and Diamante's El Cardonal (Tiger Woods' first completed 18-hole course), are slated to open October 9 and mid-December, respectively. These two new venues will bring the destination's total course count to 14, qualifying Los Cabos as Mexico's golf capital. Electricity, telephone, Internet and potable water supplies has been fully restored in Cabo San Lucas. No major structural damage was inflicted by the storm, enabling Los Cabos to recuperate quickly. Los Cabos International Airport (SJD) reopened to commercial flights on Oct. 3. The federal government has made the recovery of Los Cabos, Mexico's third most popular tourism destination, a top priority. (Los Cabos, which includes Cabo San Lucas, San Jose del Cabo and the 20-mile 'Corridor' between them, attracts about 2 million visitors per year, many of them golfers). "The response from the federal government has been beyond incredible," said Greg Tallman, director of golf at Cabo del Sol, of the government's $5 million recovery campaign. "This is the playbook for how to deal with a natural disaster." According to the Mexico Tourism Board, approximately 5,000 hotel rooms in Los Cabos are expected to open by Oct. 15, with an additional 7,000 rooms to open by Nov. 15 and a final 10,000 rooms to become available by Dec. 15. A new advertising campaign designed to support the recovery effort, entitled "Los Cabos - Unstoppable," will launch Oct. 15 and will include digital/social media engagement, TV ads, and on-the-ground activations/events. Los Cabos, located at the tip of the 1,000-mile long Baja Peninsula, is one of the world's most diverse tourism destinations. Boasting a dramatic desert backdrop nestled by coastlines of the Pacific Ocean and Sea of Cortez, Los Cabos is home to award-winning resorts and culinary offerings considered some of the finest available anywhere. A growing list of championship golf courses, rejuvenating spas, world renowned sport fishing tournaments, and state of the art convention facilities add to the destination's unmatched appeal. For more information, images and videos from Los Cabos, please visit www.visitloscabos.travel, Twitter @LOSCABOSTOURISM, Facebook, YouTube, Pinterest and& Instagram.